Dry shampoo: the beauty essential of fitness-loving ladies everywhere. Hair experts recommend against washing your hair every day. But if you’re sweating up a storm on the regular, this creates a bit of a hair problem. Dry shampoos can serve as a stop-gap to keep your hair from getting completely gross until you’re due for your next full hair washing. But which ones actually work for sweat-session-loving ladies? 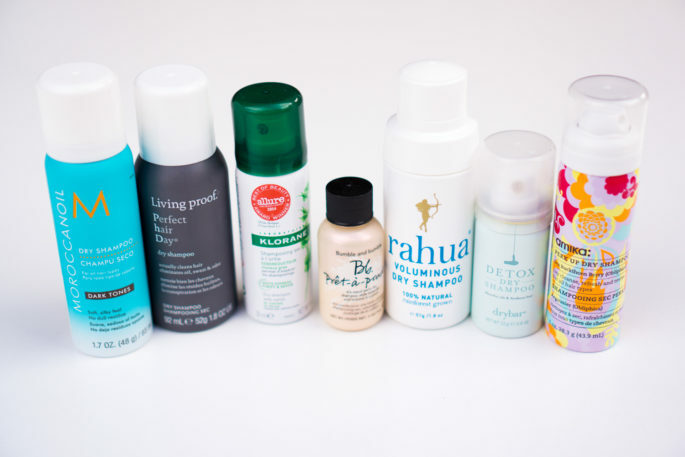 I bought and tested a few popular dry shampoos to see which ones were worthy of a spot in my gym bag. Normally, I wash my hair every other day and use a shower cap the other days. I have thicker than average, uncolored, somewhat oily hair. My individual hairs aren’t especially thick, but I have quite a lot of them. When you add sweaty workouts to my already oil-prone scalp, things can get a bit slimy. For the purposes of test-driving these dry shampoos, I let my hair go to a third day without washing. For example, if I washed my hair on Sunday, I would test the shampoo on Wednesday morning (or earlier if things got really out of hand). By the time day #3 rolled around, my hair was visibly oily and limp. This way, it would be obvious if these products really made my hair look and feel cleaner. I applied each product according to the instructions on the bottle, though sometimes I did multiple applications. I didn’t wear any other hair products so that I could most accurately assess the effectiveness of each product. And lastly, I tested each product at least 3 times so I could make sure that the results I got–whether good or bad!–were consistent and repeatable. It takes a couple of layers to get the level of oil-reduction I was looking for, but the end result was very nice. It has a fresh, clean scent coming out of the bottle, but it fades quickly and isn’t too overpowering. It left my hair feeling soft and fresh once I got enough layers on, I just wish it took fewer layers to get there. This formulation is a powder that’s packaged to look like the sprays. You twist the top to the opening, then squeeze the bottle to “spray” out the powder. It was a little bit hard for me to control the amount of product that came out and it tends to erupt in a small cloud of powder. The powder is mostly light in color, with some earthy flecks. It left a slight light-colored residue on my hair when I initially applied it, but it blended in and brushed out easily. Once on the powder is on your hair, it has a really pleasant, natural smell. This is the one and only product where my husband commented that my hair smelled good. The powder itself was very effective. It cut all oil and was outstanding at adding volume back to my hair. That said, it did leave a chalky, stiff texture. So while it’s very effective, it’s not the best option if you want soft, touchable hair. If your hair is dry, it may make that issue worse. The other downside with Rahua’s product is that the price tag is quite a bit higher than the rest. That makes the product hard to justify when others can achieve a similar effect at a lower price. That said, it’s a pretty large amount of powder, so it should last quite a long time. This product is the second powder in the lineup. This powder is white, but I didn’t have problems getting it to blend in. It doesn’t take a ton of powder for the product to work. Just a thin streak on either side did the trick. It managed oil very effectively and left my hair voluminous and soft. There’s no significant smell. Unlike the Rahua bottle above, the packaging on this one makes it very easy to apply and easy to avoid explosions of powder. The clean application is a big plus since I don’t have to be as worried about inhaling product. I bought the travel size, which is the perfect size to throw in your purse or gym bag. As you can see, it’s considerably smaller than every other product here, most of which are also travel sizes. That said, I’ve used this one a lot and there’s still tons of product left. Basically, despite its smaller packaging, you aren’t getting fewer uses. Also, because there’s no aerosol, it’s ideal for airplane luggage since it doesn’t have to be in your liquids bag like the aerosol products. I took this one with me when I traveled for Christmas and I loved how little space it took up. This formulation was the only one offering different options for different colored hair. They have two versions: one for lighter hair and one for dark. I opted for dark. As intended, this product did not leave any trace of white cast to my hair. There was no noticeable smell after I finished applying. That said, even after many layers, I didn’t get a great oil-fighting result from this one. Any freshening of my hair was no longer visible by the afternoon. Sadly, this was my least favorite, due to the fact that I just could not get the results I wanted with it. The Amika shampoo has a perfume-y smell, but it fades after a bit. This one didn’t leave much of a white cast on my hair, and what little there was blended easily. It took several layers to get the clean effect I was looking for, and this one didn’t add a lot of volume. Overall, this one was another middle-of-the-road performer. As its name suggests, the Detox shampoo was pretty effective even with just one layer of application. It left a white cast on my hair initially, though I was able to blend it in pretty well. If you have very dark hair, you might have a harder time getting the white cast to blend in. It left my hair feeling soft and clean. The biggest downside with this shampoo is that it has a strong, salon-ish kind of smell. I applied all these dry shampoos in the morning, and by the time I went to shower, I could still smell this one in my hair. This was definitely the strongest smell of the bunch, which for me was a negative. Living Proof’s formulation is one of the best-rated dry shampoos, and it’s pretty clear why. It was very effective for me after a layer or two. It left my hair feeling so soft, like it had really just been washed. I didn’t notice any white cast to my hair after a little bit of blending. The smell was noticeable but not overwhelming, similar to other Living Proof products I’ve tried. There was a slight smell that lingered throughout the day, but fortunately it wasn’t as strong as the Drybar shampoo. Out of the seven I tried, I would most highly recommend the Living Proof and Bumble and Bumble products. Which one you choose depends on whether you prefer an aerosol or a powder, and whether you are ok with a little shampoo. Out of all the products, these are the ones I am most likely to buy again. Even on days where I wasn’t doing product testing, I found myself reaching for one of these whenever I wanted a little extra boost in my hair. I still have lots more on my list, like Ouai, Lush, Verb, as well as less expensive drug store brands. Let me know in the comments if you have a favorite you think I should try next! P.S. My other hair secret weapon: a silk pillowcase. My hair is so much softer and straighter with this! Thanks for the review! I love trying new dry shampoos :) My favorite is definitely the Living Proof as well..it makes my hair look so fresh and clean! I have been thinking about getting a dry shampoo to deal with sweat workout. Thank you for the timely review! I will give living proof a try since I love their anti humidity products already. Heh, perfect! 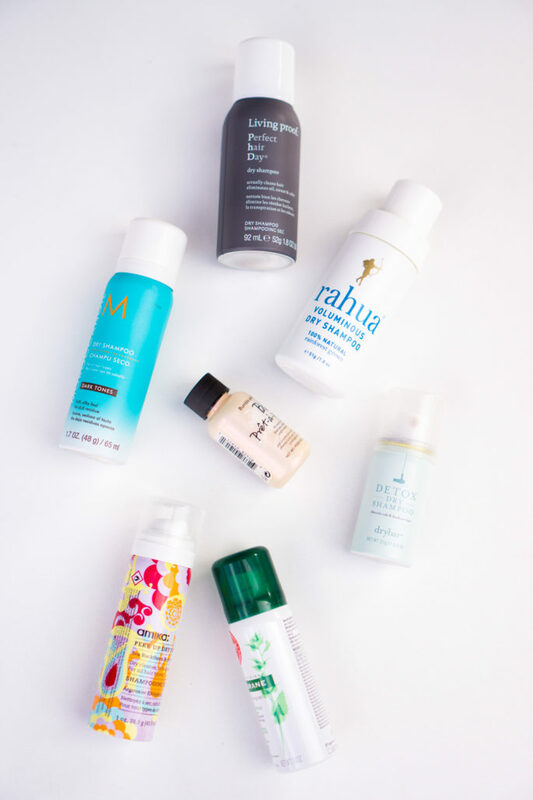 :) If you like Living Proof products, I think you’ll like their dry shampoo too. Hmm I might have to try the oat milk Klorane too. Batiste seems to be a popular choice from the comments! I’ll definitely be trying it out. I like living proof and my go to drugstore brand is Batiste. i have a full-size bumble and bumble and use a little (from my bangs) pretty much every day. i’ve had it for over a year – probably more like 1.5 years – and i still have a solid amount left. it’s incredible. despite this positive experience, on my last visit to the states, i was coaxed into buying a bottle of oribe for $45 (you read that right) and i don’t think it was worth it. the good thing is that there is no white color and hair stays soft and bouncy. i’m more comfortable having someone run their hands through my hair after applying oribe than after bumble and bumble. the bad thing is that it takes a pretty substantial amount to see an impact, and it’s stupid expensive. other dry shampoos that are literally awful: toni&guy and batiste (some would call this sacrilege, but i think batiste is way too thick and cakey). Hmm good to know, I’ll definitely steer clear of Oribe, although at that price, I think I’d be hesitant anyway! Also, interesting that you nixed Batiste. It’s all over the comments over here. Maybe it behaves differently on different hair types. Also, being a scientist in “real” life, I basically can’t live with myself if I don’t do things methodically, haha. Batiste is like the original. A lot of people swear by it, because it’s cheap and technically works. But it doesn’t leave hair feeling light and fresh like some of the other options (at all). The big draw of Batiste is the price, I’d say (based not only on my personal experience). But of course the heaviness might work for some people. I have dark hair and, like I said before, I wear a little dry shampoo every single day. Anyway, I’ll be interested to hear what you think! I have a bumble and bumble aerosol dry shampoo that comes in 5 different tints: red, blonde, light brown, dark brown and black. I use the dark brown and LOVE it because it works and it has no smell. I’ve never seen the Bumble and Bumble product you tested. Oh interesting, I didn’t know they had an aerosol dry shampoo! Funny neither of us knew about the B&B product the other tried. :) No smell is definitely a plus! The powder doesn’t have a scent either. Batiste! Great option for something like $6. Yeah that’s definitely compelling! Most of these were twice that price just for the travel size. I’d like to know how Not Your Mothers (unscented) compares to the ones you like. The NYM dry shampoo is MAGIC in a spray can. I look forward to dirty hair so I can whip that stuff out! Bonus: it’s super cheap and creates some good volume. Awesome! 2 votes for NYM then. :) Thanks for chiming in! Perfect Hair Day Living Proof is my go-to for extra oily days. Kerastase makes a great one for lighter days that is truly clear (whereas for me the Living Proof takes a little work to blend on my dark hair). Oh that’s nice! I didn’t have much trouble blending the ones I tried, except perhaps on the days where my hair was *really* bad. I’ll keep that one in mind! Klorane also comes in a non-aerosol version, I used to use that but then got a sample of Blowpro and it is just so much better! It’s a super fine powder, so really easy to work through hair, and unscented which I very much prefer. I actually have fine, thin hair and my trick is applying a little bit of dry shampoo to CLEAN hair after I’m done blowdrying. It gives a little bit of extra texture/volume and keeps hair clean longer! I also use a big powder brush to apply to “strategic areas” around the face without risking getting too much white stuff on me. I’ve been coveting that pillow case for so long! I just can’t stomach the price. Living Proof is my hands down favorite, I’ve repurchased many times. Thanks for reviewing the others, my dry shampoo FOMO is cured. On the plus side, at least the pillowcase doesn’t go bad. :) There are some cheaper silk pillowcases on Amazon for something like $20, but I ended up going for the higher priced one because I was a little worried the cheaper ones wouldn’t be quality. I’ve been using the same slip silk case for 6 months and it’s still going strong. I really need to learn how to use this stuff – I wash my hair everyday, and I know that’s wrong but my scalp is just so oily after 24 hours! And my individual hairs are really fine, so I know the process of washing/drying everyday is hard on them. I tried using the spray-on stuff once and it just felt – wrong, almost like glue in my hair. Is there a trick to adding dry shampoo? Like, do you comb it through after applying or what? Sorry if this should be common sense! I spray it on in a swift sweeping motion about 12-18″ from my head (a comfortable arm’s length), making sure to move it quickly enough that it doesn’t build up too much in one area. Usually I’ll go around my head 2 or 3 times. From there, some of the instructions say to wait a couple minutes, but whether you wait or not, all the ones I bought do say to rub it in just like if it were regular shampoo. Then, lastly, I brush it out. I’m not sure if there’s a more sophisticated technique, but that’s what I do! If that’s what you did and it was still sticky, maybe it was just a bad product? Whatever the case, totally valid question! Thanks! I think it was a combo of bad product and me just spraying it on and leaving it like that. It really never occurred to me to rub the stuff in or comb it out! Next time I’ll know better. Love this review and look forward to more! I’ve been researching dry shampoos, and I think I’ll give your top two a try. Thanks! Huh, go figure! We probably just have different hair chemistry I suppose. I noticed a couple of the cans I bought came out like a rocket the first time, but then I figured out how to press the top so it would come out in more of a mist. For sure- mine is finer than yours, but similar in cut and color. :) Love your review though, and I will have to pay attention to how I press the top to see if maybe I’m the culprit with the Amika dry shampoo. I use their hairspray and love it! Try batiste (but not volume XXL one). I am also not a fan of Batiste. I love the Aussie dry shampoos. They work really well for me and smell amazing ? This and the skincare post have been so helpful. Thanks you. I hope you continue to do these types of posts. I bought the bumble and bumble and living proof and both work great as you said.